Short Covering - What Does It Mean? What is "short covering"? 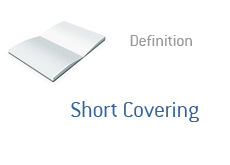 What is the definition of the term "short covering"
Short covering occurs when somebody closes out a short position. A "short position" is when a trader believes that the price of a stock is going to drop, so they borrow shares, sell them and then hope to buy them back at a lower price. Short covering is when a short seller closes out their position. To do this, they need to purchase shares. For instance - let's say that a trader decided to short 1,000 shares of MSFT at $25. The stock has weakened considerably since then, and is now trading for just $20 per share. The trader decides to take his $5,000 profit (5 points x $1,000 per point). To do this, he must close out his position by purchasing 1,000 shares of MSFT in order to exit his short position. This can also be called "buying to cover". By purchasing the 1,000 shares of MSFT, the trader returns the borrowed shares and is now out of the position.